Krypt Towers' Universal Wall Mounted Board Storage Rack. The heaviest duty board rack anywhere. Our rack is designed with board sport enthusiasts in mind, and it delivers. The rack system is fully adjustable to fit all kinds of boards; Snowboards, Snow Skis, Wakeboards, Surfboards, Kneeboards, Wakeskates, Wakesurfers, Water Skis, Skateboards, Skimboards, Skimboards, Bodyboards, Freeboards, Longboards, Mountainboards, and more. Included are 2 x 48" vertical tracks, 8 x 15" length fingers, and hardware to install directly to wall studs or drywall. Fully adjustable wall rack system can be installed with indefinite width configurations to adjust to your boards. The fingers can be adjusted up or down by moving them along the rail slots to adjust for any board thickness. The rails and fingers are constructed with heavy duty steel. Each rail is extra wide to accommodate board weight, 6 wall screws, and to distribute more weight along more surface area for a solid installation. Our finger is surrounded by a thick rubber board bumper for superior board protection; this provides board ding protection above and below your board. Our wall rack kit comes with everything you need for installation. This system can mount to finished our unfinished walls anywhere in your home; Bedroom, Living Room, Garage, or Shed. Simply space out the rails, mark for drilling holes, insert drywall anchors or screw directly to studs without. Slide fingers into the slots, and store your boards. It's that easy. THE MOST HEAVY-DUTY BOARD STORAGE RACK! - Looking for a practical and reliable way to store and display your surfboards or skateboards? The Krypt Towers univerasl wall mount board storage rack is here to help you store all your extreme sports boards like never before! PROTECT YOUR PRECIOUS BOARDS FROM ACCIDENTS! - If your skateboards, longboards or surfboards are lying around in your garage or storage room, they can be easily damaged. But with the Krypt Towers wall mounted storage rack you can protect them and keep them in perfect condition! ADJUST ITS SIZE TO COVER YOUR NEEDS! - Mounting our robust metal rack is a breeze, since you'll find everything you need in the package! And the best part? You can easily adjust its width and height to fit almost any type of board, while the padded rubber fingers will eliminate scratches and damage! ELEVATE THE DÉCOR OF YOUR EVERY SPACE! 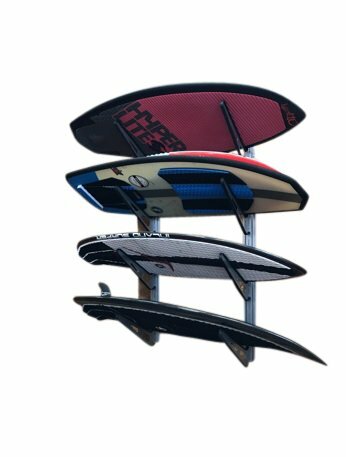 - Now you can safely store and proudly display up to 4 of your favorite surfboards, skateboards, water skis, sandboards, snowboards, wakeboards, kneeboards or longboards! Add a unique touch of surfing style to your bedroom, living room, garage or game room now! 100% SATISFACTION OR YOUR MONEY BACK! - Unlike other poorly constructed board wall mount racks, the Krypt Towers fully adjustable metal board rack will pass the test of time and protect all your boards! That's why we confidently back it with our unconditional full refund guarantee! What are you waiting for? If you have any questions about this product by Krypt Towers, contact us by completing and submitting the form below. If you are looking for a specif part number, please include it with your message.